Welcome back to the second “Thursday’s Bottle,” an occasional adventure in blind tastings and wine reviews. Here’s the deal: Ya’ll know I’m not up to consuming an entire bottle of wine every Thursday, so the blog feature I debuted as “Thursday’s Bottle” fell into the weeds pretty quickly after its launch earlier this year. Otherwise, a consistent group of food and wine geeks as serious as serious can be will gather around a table, sip wine, talk and take notes. At evening’s end, I’ll gather all the notes and turn them into a story. Deal? Good. I’ll always name the “tasters” and will never exclude a comment, but so that each of us can remain candid, I’ll never divulge who said what. Oh, wait — there is one rule: We taste blind. No exceptions. Four of us tasted grenache at my house on Friday, Sept. 19, which was International Grenache Day. Coincidence? Think again. The players: Katie Baillargeon and Marcel Rivera-Baillargeon, UCSB creative writing professor and online marketing specialist, respectively; Angela Soleno, winemaker/owner, Turiya Wines; and myself. 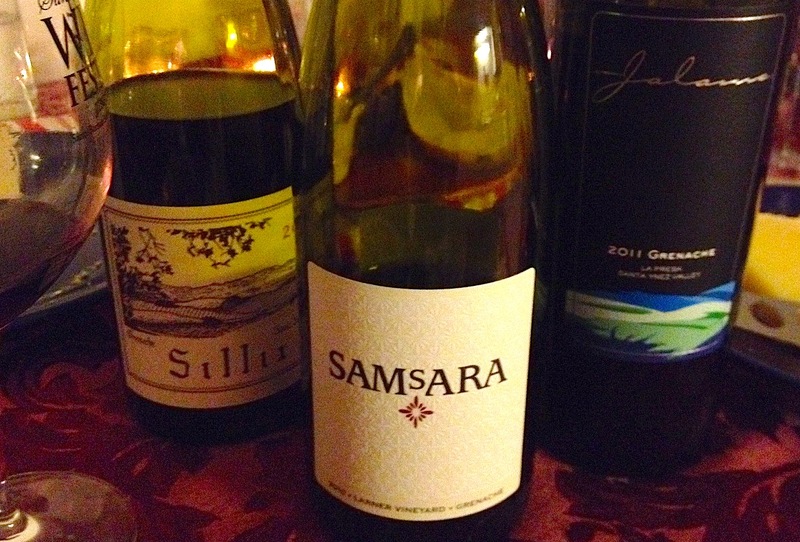 The bottles: Three grenaches, all Santa Ynez Valley, two vineyard designates. Bottle Two: “More fruit; wow; bigger, more elegant; black; yummy; lots of mid-palate spice; an elegant expression of Grenache; big and jammy; fruit forward; clay; cola; spice. My first encounter with winemaker Blake Sillix was earlier this year at Solvang’s Garagiste Festival: Southern Exposure, and his syrah and grenache were stellar. To have this bottle be corked was beyond disappointing. It’s been months since I posted a wine for the weekly “Thursday’s Bottle.” I have no excuse — especially since I still drink a lot of wine, even on Thursdays. Tonight, to honor the hundreds of writers descending on Buellton for the annual Wine Bloggers Conference, and because it’s a lovely warm summer evening, I offer up a rosé. Those of you who follow my writing know that I just switched my “Wine Country” column from the local newspapers to Noozhawk.com. My first column, July 2, focused on 11 locally produced rosés. I inadvertently overlooked this one, and I’m here tonight to tell you that it ranks right up with my favorites noted in the Noozhawk column. 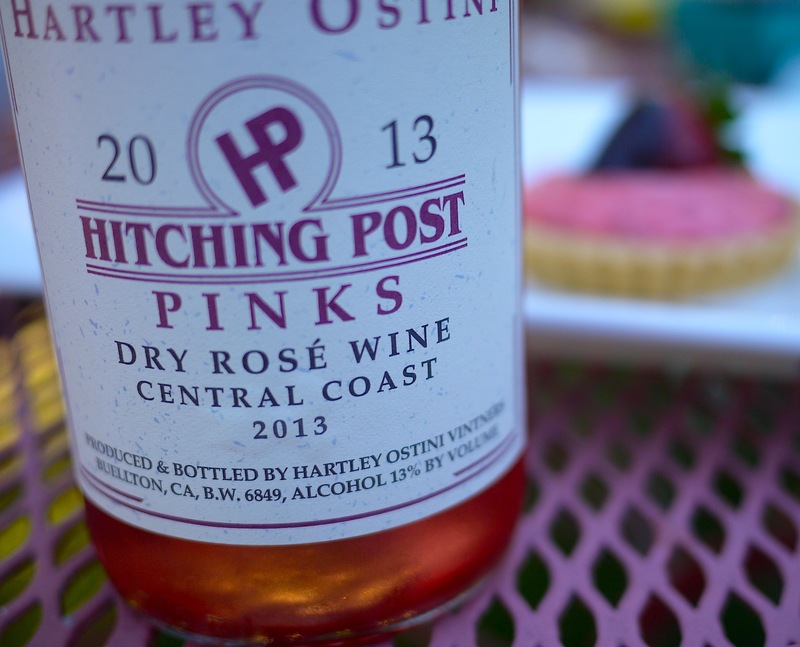 The rosé is the 2013 Hartley Ostini Hitching Post “Pinks,” a luscious blend of grenache, pinot noir and valdiguie. It smacks of fresh, juicy pink grapefruit with an undertone of ripe strawberries. I’m told it retails for $15 — what a steal! True story: I fell hard for red wine in the early mid 1980s. The scoundrel: cabernet sauvignon. This hearty Bordeaux grape varietal is all I drank. For months. I’m quite sure I’d never even heard of pinot noir, much less syrah and its Rhone cousins. This Joseph Blair cabernet sauvignon, the second label crafted by Mark Cargasacchi (Jalama Wines), takes me back almost 25 years to autumn days in a cooler, rain-laden climate, to suppers around a fireplace followed by light desserts of aged cheddar and dark chocolate. This cab displays a ruddy ruby color and a fresh cherry and tobacco nose. It’s tight on the palate with mouth-watering tannins — yet wonderfully drinkable now. True to its heritage of red fruit, with a smack of herbs and spice. Very focused. I split a bottle over two nights and then pawed through my cellar for another before realizing I’d given away my second bottle to a friend. Damn. 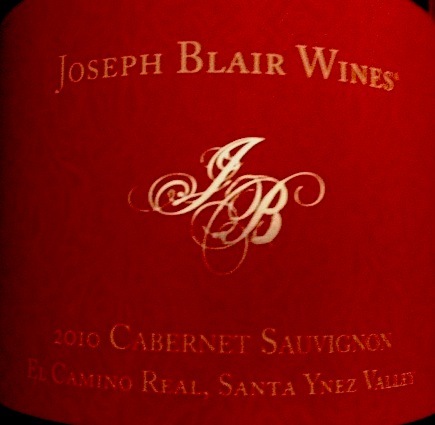 Hearty yet elegant, this Joseph Blair cabernet paired exquisitely with spicy turkey chili. Editor’s Note: While I was digging in my cellar, looking for a candidate for “Thursday’s Bottle,” Phil Carpenter whipped up a new review of yet another of his recent discoveries. Go Phil! Found this 1er at the local wine shop. It’s quite the nice bang for the buck — er, I mean pound. Got it for L10 (approximately $15 US), brought it home, and put it in the fridge. This wine is made by a co-op named Cave des Vignerons de Buxy. Who wouldn’t love this beauty? Located in Cote Chalonnaise, this co-op has been around for more than 80 years, and includes 270 members, or 120 families. The co-op carried out everything from vineyard care to running its bottling line. I had some difficulty finding more information about the vineyard, Les Millières. But its location is Montagny, on the southern part of Cote Chalonnaise. Tasting notes: Crisp apple, honeycomb, hazelnut, pear, white flowers and perfume. It’s crisp on mid-palate, but has a nice roundness to the finish. Consistent palate, but with some ripe pineapple to go with wet stones as the finish nears. Very nice little white. So I fell behind with a post. Again. I did drink a wine, however, and on Thursday. This week, Thursday was Halloween. The backstory: About a year ago I ventured to the Bounty Hunter in downtown Napa, where a friend and I each ordered a glass of wine. She had bubbles; I had a mourvèdre. I so enjoyed the wine that I bought two bottles. The wine: 2009 Graff Family Vineyards Mourvèdre, Chalone (Monterey County). Thursday three of us paired the bottle with spicy turkey chili crafted by one of us, aka the Amazing Stephanie. The chili was de-lish and the wine was extraordinary. The mourvèdre was elegant but had enough backbone to stand tall against the spice and acid of the chili. It showed more fig than prune, and more dust and light spice than mesquite. Hint of bacon. Love mourvèdre? If you find a stash of 2009 (unlikely, but possible), open your wallet and pony up for this beauty. This week, Thursday’s Bottle left the cozy red couch at home and shared a bottle of wine with friends at Succulent Cafe in Solvang. The bottle: the 2012 Sybarite Sauvignon Blanc by Doug Margerum, Margerum Wine Company. Sybarite (SIB-bar-right) describes one who is fond of pleasure and luxury. The grapes come from four vineyards: McGinley, Curtis, Grassini and Star Lane — all but Curtis are in the Happy Canyon of Santa Barbara AVA, known for its sauvignon blanc. The wine dazzled me with bold, refreshing lime and a complex finish, and paired perfectly with spicy scallops. I’d buy it again in a heartbeat. Welcome to a special edition of Thursday’s Bottle! This week, a dual tasting: One bottle from Lompoc, and one shared by special guest Phil Carpenter from across the pond. For those of you not lucky enough to know Carpenter, he recently relocated to Summertown, a suburb of Oxford, England, with his lovely wife, Rachel, and their darling daughter, Anna. He and Rachel have relished tasting many of the “local” wines that line the shelves at neighborhood shops. Face it: We have the Central Coast; Phil and Rachel have France. Next door. This week: Phil tasted a 2012 Leon Perdigal Côtes du Rhône, and I sipped a 2008 “L’Ange Rogue” from McPrice Myers (grenache, Santa Barbara County). In Phil’s words: “While I was perusing the aisles, this bottle popped out to me … expert marketing, if you ask me: The right glisten off the label on a beautiful Summertown afternoon. “I’ve always LOVED CdRs due to their “Bang for the Buck” potential. Swooped this into the cart ASAP. “I wish I could tell you more about the esteemed Leon Perdigal. I’m sure our Somm friends could dispatch more info about the gentleman. After reading the back of the label, I fully expected to get rather “geeky” with this wine. Sadly, I couldn’t find too much info. “Perdigal is a famed cellar master. Making his name at Ogier, which has been around since 1859, Perdigal was its first celler master, and established quite a legacy. Ogier is the largest cellar in Châteauneuf-du-Pape, with the ability to make large amounts of wines under one roof. “Upon initial pop, this wine was full of smoke, black pepper and licorice. After I let it breathe for a bit (two hours), out came ripe cherry and raspberry, underbrush and savory herbs. “The initial impression was very disjointed, but it leveled out a bit. Still a solid acid streak going, but a real bramble, dark blue fruit on the end of mid, going to finish. A rather ripe CdP, and I was not expecting that. “Look, I understand the disjointed effect is probably due to this bad boy being freshly bottled. On potential, I don’t know where it will go. As I mentioned, the wine has some acid, but it’s pretty ripe off the bat. All and all, not bad for L7 ($11.32 U.S.), and as a candidate for a “daily drinker” wine. My turn: Friends gifted me this bottle for feeding their cat. I have great friends. I opened this Tuesday, and let it breathe for, oh, about 10 minutes. And then I took a sip. I wrote: “Lovely” — but it deserves stronger. Try: “Exquisite.” What a stunning wine! Smoky dark cherry with a finish that lasted a full minute. Great weight in the mouth. I’m literally drooling as I write this, remembering the dusky spice, and sheer power. A better pairing would have been pulled pork or a turkey burger, but on my plate was … a tuna salad. The fish mellowed out the wine, but still. Wow. More, please. The second night, the wine was much more subtle, but still displayed cherry and blackberry with light smoke. Who else wants to have Phil be a regular contributor to “Thursday’s Bottle?” Can I have a show of hands, please? It’s still Thursday … at least for another hour! For this week’s selection, I dug deep in my cellar for “Thursday’s Bottle.” This week has been one of the busiest in recent memory, but I’ve met deadlines, helped a good friend harvest grapes and savored another fall’s cooler temperatures and a light rain. Tonight I celebrated finishing a writing project with a glass or two of a rustic wine, Mistura from Vino Noceto in Amador County. I visited this winery almost two years ago on my way to a family Thanksgiving. As I hoped, this stick-to-your-tongue tannic, “dusky” red embodies the flavors of fall. Think roasted vegetables with a side of mashed potatoes and thick butternut squash soup with a hint of white pepper and cumin. That was the pairing I envisioned; in my world, I microwaved leftover quinoa and topped it with mushrooms sautéed in butter. And it was heaven. This wine prompted me to craft a “Thursday’s Bottle” acronym: MPWF, or Must Pair With Food. This wine is big and spicy and bold. Needs food. Retail: About $23, but likely sold out. http://www.noceto.com, Amador County Red Table Wine.